Burnley FC Ladies extended their lead at the top of the North West Womens Regional League Premier Division as they maintained their 100% start with a win at Stockport County Ladies. The Lady Clarets made their best start to a gamethise season, with free-flowing football, good decision-making and sharp, short passing. Stockport struggled to keep pace with the Clarets as they created chance after chance. 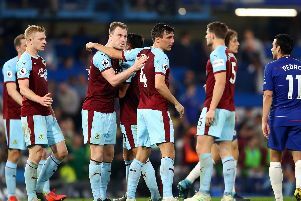 Steph Meeks put Burnley ahead, as she returns following the birth of her children, rediscovering the form that saw her destroy defences with her quality and guile. Following a slick passing move from right to left, Meeks hit a 30-yard screamer which looped over the keeper. It was down the left hand side that the second goal came, as great combination play between Meeks and Linny Craig led to Meeks picking out a superb cross into Justine Wallace, who beat the off-side trap, then coolly brought the ball down to slot it into the bottom corner. Any Stockport attacks were brought to a sharp halt by the tireless tackling in the midfield by Sarah Greenhalgh, Emma White and new signing Chelsea Penny. A deserved 2-0 lead at half-time spurred on the Clarets on to hold off a Stockport resurgence at the start of the second half. Full backs Meeks and Holly Hunter were equal to anything Stockport had to offer and were at the forefront of many counter attacks, with Craig and the tireless Lizzy Hamer. It was from one of these tackles that the third goal arrived. Hunter played the ball into Hamer, who found the feet of Penny, who slipped past her marker with ease and then slotted the ball between the Stockport back line into the path of Craig, who finished with aplomb. With the game under control at this point, the Clarets were determined to keep their first clean sheet of the season and put in some brave tackles from captain Jo Holt and fellow centre half Paula Duffy, alongside some safe handling from keeper Karly Bland. However, Duffy ended up leaving the pitch with a head injury, which saw the introduction of Emilie Forrest to steady the midfield. Greenhalgh selflessly slotted into the back four and made a number of crucial tackles to help the Clarets backline. The Clarets were unfortunate not to extend their lead when another new signing Angelica Uguri was released through the middle and was unlucky not to see the ball hit the back of the net. The Lady Clarets had to settle for a 3-0 win as they made it four wins from four games in the league to head Blackpool by two points. Player of the match was Hamer. The Lady Clarets host winless Birkenhead at home at Barden Athletics track on Sunday, when they will look to extend their lead at the top of the table. Burnley then travel to face Manchester Stingers the following Sunday, again in league action.